1Heart Group of Companies spearheaded by its CEO Belina Calderon Tagarao recognized annual awardee employees and launched its biggest expansion program starting year 2015 during its special corporate event held at Castaway Restaurant at Burbank California last December 5. 1Heart CS officers, employees and special guests enjoyed the night of awarding, launching, Christmas celebration, special performance and games organized by 1Heart special committee. 1Heart Caregiver Services (http://www.1HeartCares.com) CEO Belina Calderon Tagarao presented 2 special awards ‘Above and Beyond’ for honorees Mari Reola, 1Heart Office Manager and L.A. Jobs Human Resource Manager and Randolph Clarito, Director for Business Development and Training. The ‘Above and Beyond’ award is given for the loyal dedication and unwavering commitment that produced outstanding contributions towards company’s goals and making the organization stand above the rest. 1Heart Caregiver Services awarded its first caregiver to achieve her 10 years of loyal service with a dedicated and compassionate care as admired and validated by client’s daughter Susan Corbin for her mother Helen Roseman of Sunrise Senior Living Santa Monica. Master of Ceremonies Pam Sison, L.A. Jobs Legal and Marketing Specialist and Kevin Tagarao, 1Heart Vice President of Operations presented 1Heart ‘Shining Star’ awards to caregivers with 4 years of loyal service with outstanding care provided to clients with other parameters reviewed and evaluated by the management committee in order to qualify. 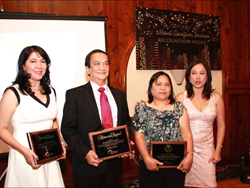 Awardees are Rosemarie Belcina, Francis Calderon, Cesar Catimbang, Yola Hall and Emily Lumba. They were carefully selected and screened among the 80 to 100 total caregivers within the 1Heart personnel. To conclude the recognition program, ‘Loyalty Award’ were given to managers and caregivers who have served 1Heart Group of Companies for more than 5 years. The honorees are Mari Reola, Anne Capili, Arnold Navarro, Randolph Clarito, Helen Bala Bala, Rosemarie Belcina, Ana Regular and Grace Tatel. The biggest expansion program of 1Heart Caregiver Services was launched by Director Randolph Clarito which highlighted its programs and initial plan to participate in the next Franchise Expo to be held at Houston Texas on the 5th of February 2015. Randolph introduced Franchise Marketing Systems Consultant Devin Conner to deliver his inspirational message how they collaborated with our group and helped our company in our franchise development stage and forge a partnership in helping our brand grow in different states all across America through FMS group headed by its President Chris Conner, Vice-President Allan George and COO Tom DuFore. Randolph Clarito presented a meaningful testimonial of 1Heart client Harry Findley of Thousand Oaks where Harry speaks highly of the company and its compassionate caregivers Albert Balbacal, Andy Baluyot and Jacob Nicolas. Harry Findley, who missed the special event due to his unexpected hospitalization sent his collage of pictures and events framed in a wooden structure to inspire some stroke patients how they can recover from stroke case, which he titled ‘A trip to Hell and return trip to the World’. In his elaborate caption of events during the difficult moment, Harry thanked Los Robles East Campus Rehab center, their doctors, nurses, physical therapists, caregivers and occupational therapists and all his family members for the support and medical attention which provided him extended life. 1Heart Group of Companies recognized all special guests and allied partners who graced the special event with their presence and their support for the entire year making 1Heart a strong company that remains committed to extend its operations all across America. The special event was honored by 1Heart Brain Fitness Program Director Tee Barr and husband Paul, L.A, Chamber Ambassador Glenn Bowie and Holly Bachman, Business owners Danny Nernberg and Kamran Ghasri, Axxess Executives Marvin Javellana and Cameron Gerald, Fairwinds Senior Living GM Harold Bermudez, Kaiser RN Jennifer Lim, Lucille Martinez and Myra Legaspi, Conservator Ed Anderson, Herald Home Health owner Mitzi Gingson and husband, Emeritus Directors Aurora Benko, Nimisha Tomar and Betty Brown, Quality Care Ambulance GM Jake Black, special friends and spouses. 1Heart Caregiver Services™ (1Heart CS) http://www.1Heartcares.com is a premier In-home care service company that provides professional private care duty to seniors and adults requiring assistance in their home and healthcare needs for the past 11 years. The company is run and managed by healthcare Executives with local and international training with combined top level executive work experience of more than 50 years. CEO Belina Tagarao is a Los Angeles IMAGE AWARDS honoree 2013 and HiFi 2014 Fil-American awardee as HiFi Ambassador of Goodwill within the Fil-American business community in Los Angeles. 1Heart CS is the only In-Home Care company that has its in-house 'Caregiver University' spearheaded by Training Director Randy Neil in Southern California area that provides professional caregiver training held at its Los Angeles head office aligned with its ‘Continuing Professional Education’ program implemented to all corporate managers and staff of the company and extended to senior living facility requiring in-service training for their staff. The Staffing department headed by Staffing Officer Jennifer Remigio, Charlotte Baseleres and associate Bernadette Manahan takes charge of staffing solutions to all cases, hiring, payroll and screening of all applicants and update of caregivers, CNA and HHA data base that can readily be assigned to new and existing cases handled by Client and Care Managers Arnold Navarro, Anne Capili, Shirley Billedo and Andrei Peralta assigned in each target County. The company Vice-President of Operations Kevin Tagarao has consolidated the company’s daily operations, established online web presence and facilitated integration of new technologies. The company carries out a ‘Circle of Care’ process that is uniquely implemented by all 1Heart Managers and remains unmatched by any senior care service company. 1Heart CS is a Certified Member of CAHSAH, California Association for Health Services at Home, Los Angeles Chamber of Commerce, Conejo Valley Chamber of Commerce, BBB and operates in Los Angeles County, Orange County, Ventura County, San Fernando Valley, San Bernardino County and Santa Barbara County area. For a case evaluation, call #213-351-9100 #805-338-8100, #310-779-6254, #818-561-6641 and #562-412-2420 for an agreed schedule of appointment. For caregiver applicants with minimum of 2 years work experience, look for Jennifer Remigio to process the application with the submission of live scan finger print, SS card, CA Driver’s license, CPR / First aid certification and TB test results. 1Heart Caregiver Services is now officially declared as a Master Franchisor having received the California state registration legally allowing 1Heart to offer franchise to different business group all over USA. The leading career and visa specialist in Los Angeles for foreign professionals. L.A. Jobs, http://www.lajobsea.com provides more opportunities for international workers who are highly qualified professionals and competitive to be able to build their career in the U.S. The company had successfully placed hundreds of applicants in the past few years even during the period of recession and it had attained a high approval rate of H-1B work petitions and green card of applicants enabling them to take the path to citizenship through employment and live the American dream. The company aims to be the premier leader in the employment industry in the U.S.
Visit for no charge consultation and look for Mari Reola, HR Manager and Pam Sison, Legal and Marketing Specialist or call at #213-351-9100. A fast growing Medical Billing company that helps physicians and other medical and healthcare companies obtain payment from insurance carriers and patients by effectively handling insurance claims and aid them to manage their practice and finance side efficiently. Summit Medical Billing with its staff Arielle, Pauline and Christina aims to establish a strong alliance with the American Medical Association and continue to provide help to their members increase their revenue with the efficient handling by the company's billing expert. 1Heart CS CEO Belina Calderon bestowed the Ambassador of Goodwill Award by Historic Filipinotown Neighborhood Council Los Angeles California. Historic Filipinotown (HIFI) is a district of the city of Los Angeles, California and as a HIFI Ambassador of Goodwill and honoree, Bel Calderon will act as a role model and leader of the Filipino-American community of Southern California. The Historic Filipinotown Neighborhood Council is bestowing the title of HIFI Ambassador to carefully selected Filipino-Americans who are persons of integrity and impeccable leaders with exemplary achievements that have the ability to promote, reach out, influence and mobilize public interest in and support for the ideals, values, principles, programs and goals of Historic Filipinotown. The HIFI Ambassadors awarded have exemplified great success in their profession that had established themselves as movers and shakers in the community. HIFI Ambassador Bel Calderon is the founder and CEO of 3 companies: L.A. Jobs employment agency, Summit Medical Billing and 1Heart Caregiver Services, Belina has been responsible for the company's increased productivity and consistent profitability for more than 10 years. Belina provided the vision, leadership and direction that the company needed to achieve its short term goals and long term goal. As her greatest accomplishment, the company is now equipped with expertise to expand its business operations to different States in the U.S. by the third quarter of this year 2014. Belina's company, 1 Heart Caregiver Services is a certified member of CAHSAH California Association for Health Services at Home, member of Los Angeles Area Chamber of Commerce and have been featured in Asian newspaper and other media publications all over USA. The company recently had a ribbon cutting of the new training facility of its in-house CS Caregiver University and launching of its 1Heart Business Academy. 1Heart Caregiver Services ™ (1Heart CS) http://www.mycaregiverservices.com is a premier In-home care service company that provides professional private care duty to seniors and adults requiring assistance in their home and healthcare needs for the past 10 years. The company is run and managed by healthcare Executives with local and international training with combined top level executive work experience of more than 50 years. The leading career and visa specialist in Los Angeles for foreign professionals, L.A. Jobs, www.lajobsea.com provides more opportunities for international workers who are highly qualified professionals and competitive to be able to build their career in the U.S. The company had successfully placed hundreds of applicants in the past few. The company aims to be the premier leader in the employment industry in the U.S.
Visit for free consultation and look for Mari Reola, HR Manager and Pam Sison, Legal and Marketing Specialist or call at #213-351-9100. A fast growing Medical Billing company that helps physicians and other medical and healthcare companies obtain payment from insurance carriers and patients by effectively handling insurance claims and aid them to manage their practice and finance side efficiently. Summit Medical Billing aims to establish a strong alliance with the American Medical Association and continue to provide help to their members increase their revenue with the efficient handling by the company's billing expert. Call for free evaluation and consultation at #213-351-9100. Let us help you find one. Click here to view our jobs listing.